Four-image photo mosaic comprising images taken by Rosetta’s navigation camera on 31 August 2014 from a distance of 61 km from comet 67P/Churyumov-Gerasimenko. The mosaic has been contrast enhanced to bring out details. The comet nucleus is about 4 km across. ESA’s Rosetta orbiter has now moved in so close to its comet quarry that the primordial body overwhelms the screen, and thus its snapping mapping mosaics to capture the complete scene of the bizarre world so it can find the most suitable spot for the momentous Philae landing – upcoming in mid-November. In fact Rosetta has ‘drawn and quartered’ the comet to collect high resolution views of Comet 67P/Churyumov-Gerasimenko with the navcam camera on Sunday, August 31. The navcam quartet has just been posted to the Rosetta portal today, Monday, September 1, 2014. ESA invited readers to create global photo mosaics. See above our four frame photo mosaic of navcam images Rosetta took on Aug. 31. The purpose of taking the images as well as spectra and physical measurements up close is to find a ‘technically feasible’ Philae touchdown site that is both safe and scientifically interesting. Below is the Rosetta teams four image navcam montage, arranged individually in a 2 x 2 raster. The navcam image raster sequence was taken from a distance of 61 km from comet 67P. “Roughly one quarter of the comet is seen in the corner of each of the four images. The four images are taken over an approximately 20 minute period, meaning that there is some motion of the spacecraft and rotation of the comet between the images. As a result, making a clean mosaic out of the four images is not simple,” according to ESA’s Rosetta blog. 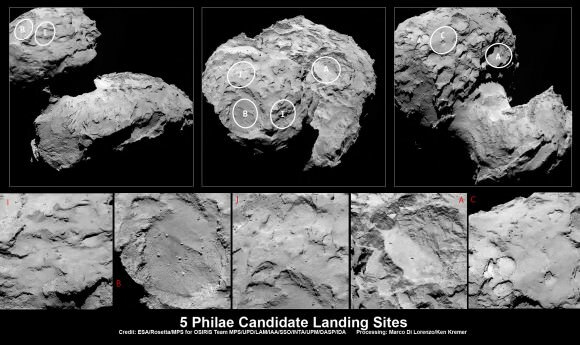 As I reported here last week, the ‘Top 5’ landing site candidates have been chosen for the Rosetta orbiters piggybacked Philae lander for humankind’s first attempt to land on a comet. The potential touchdown sites were announced on Aug. 25, based on a thorough analysis of high resolution measurements collected by ESA’s Rosetta spacecraft over the prior weeks since it arrived at the pockmarked Comet 67P/Churyumov-Gerasimenko on Aug. 6, 2014. See our montage of the ‘Top 5’ landing sites below. Rosetta is a mission of many firsts, including history’s first ever attempt to orbit a comet for long term study. Philae’s history making landing on comet 67P is currently scheduled for around Nov. 11, 2014, and will be entirely automatic. The 100 kg lander is equipped with 10 science instruments. The new images released today are the best taken so far by the Navcam camera. The probes OSIRIS science camera are even more detailed, and will hopefully be released by ESA soon! “This is the first time landing sites on a comet have been considered,” said Stephan Ulamec, Lander Manager at DLR (German Aerospace Center), in an ESA statement. Since rendezvousing with the comet after a decade long chase of over 6.4 billion kilometers (4 Billion miles), a top priority task for the science and engineering team leading Rosetta has been “Finding a landing strip” for the Philae comet lander. “The clock is ticking’ to select a suitable landing zone soon since the comet warms up and the surface becomes ever more active as it swings in closer to the sun and makes the landing ever more hazardous. The three-legged lander will fire two harpoons and use ice screws to anchor itself to the 4 kilometer (2.5 mile) wide comet’s surface. Philae will collect stereo and panoramic images and also drill 23 centimeters into and sample its incredibly varied surface. “As a result, making a clean mosaic out of the four images is not simple,” according to ESA’s Rosetta blog.” Ken Kremer and Marco Di Lorenzo kind of blow that statement away… eh? Good job doing the ‘not simple’! How good are “ice screws” on rock? we’ll find out soon. be sure to tune in! Previous PostPrevious 25 Days from Mars – India’s MOM is in Good Health!